CouchPotato is a wonderful set and forget python script to automatically download and pass movie torrent files to torrent downloaders or NZB files to NZB downloaders. In this post I will explain how to install CouchPotato on Ubuntu, including Ubuntu Server 14.04 Trusty Tahr. You can search add movies to download through the CouchPotato web interface or directly from sites like imdb or rottentomatoes. If you are not comfortable with Linux commandline or if you are do not want to go through these steps one by one, then you my try our 1-step CouchPotato installer script for Ubuntu (see it's magic in operation in this CouchPotato installer video). In my other post, I explained how to setup CouchPotato on Windows. Now let us look at how to install CouchPotato on Ubuntu. 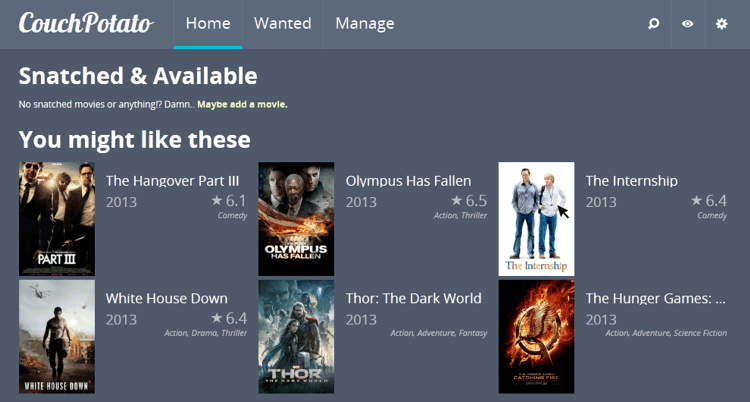 CouchPotato offers several awesome features including automatic downloading through SABnzbd or bittorrent software, one click addition of movies, automatic sorting/renaming movies, automatic trailer/subtitle/artwork downloading, quality options, support for NZB indexing services and more. It is very similar in operation to Sick Beard app for downloading TV Shows, which is described in my other post. If you setup CouchPotato correctly, all the above functions should work flawlessly giving you an automatic Usenet downloads and organization of Movies. Without further delay, lets install CouchPotato on Ubuntu. After your CouchPotato V2 (aka CouchPotato Server) is running you can delete the previous version's folder (.couchpotato_v1). This will download the contents to the folder .couchpotato. The “.” in the front keeps the .couchpotato folder hidden. That is all there is to setup CouchPotato on Ubuntu. You may also update CouchPotato app by clicking “Update to Latest” from the settings menu or click on the update notification that appears on top of the screen (shown below). For now, http://localhost:5050 should be enough. After you install CouchPotato on Ubuntu, you can configure it as described in the following post: How to Configure CouchPotato V2?. It explains all the settings in detail with screenshots. After configuring your CouchPotato, you may return to this post and continue. In order to make CouchPotato function properly, you will have to install and configure SABnzbd to listen to download requests from CouchPotato. Please refer to my SABnzbd installation guide and configuration guide to properly automate downloading movies. As mentioned earlier, you also require a reliable Usenet account. You may get a free Usenet account as described in this post, or go with a reliable Usenet service from Astraweb. CP_HOME and CP_DATA are important. They are the folder in which CouchPotato is installed and database is stored, respectively. Typically, they refer to the same folder. CP_USER should be your username. Alternatively, you can create bash_aliases to simplify starting, stopping, and restarting CouchPotato using shortcut commands. If you are not comfortable with Linux commandline or you do not wish to go through the above steps one by one then you may try our 1-step CouchPotato installer script for Ubuntu. That is all there is to CouchPotato installation. Go ahead Install CouchPotato on Ubuntu and enjoy.